This evening though was a result in my view.. I ransacked the vegetable drawer and a few other strategic places I cram stuff into, and found a bounty of great ingredients – all a good few days out of date. But this is the key thing, perfectly fine. My find, and what spontaneously let me to make this recipe was: a fennel bulb; chicory; blueberries; new potatoes; remains of a packet of dill (last used for my Smoked Salmon, Dill, and Red Onion Omelette); an avocado, and red onion. I have been struggling what to name this recipe as it is so packed full of flavour – I really could not reel off all the contributing ingredients in the recipe’s name – that would just be nuts. If it wasn’t for my left over ingredients in need of being eaten, this recipe would never seen the light of day. Will I adapt it? Time will tell, but for now, it is an absolute winner, even if you think the combination of smoked fish and blueberries seems disgusting. 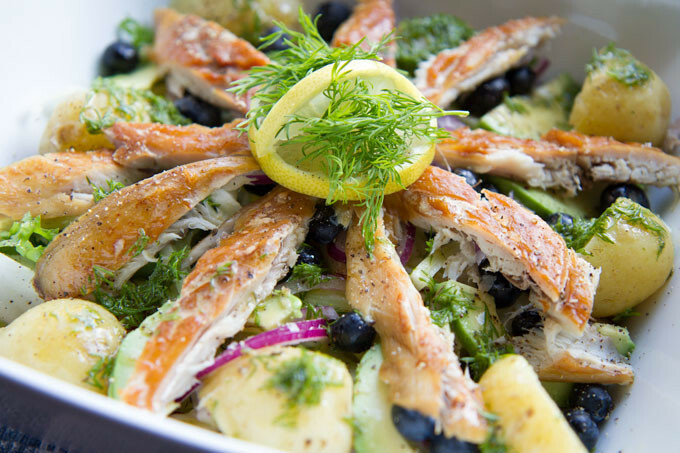 I hope you enjoy my Smoked Mackerel, Blueberry, and Fennel salad as much as I did putting it together. Smoked Mackerel and blueberries in the same dish? The combination works surprising well. First, cook the potatoes. This is the only cooking required. Either boil in slightly salted water, or steam for approximately 14-20 minutes. I prefer them to have a slightly firmer texture. Once cooked, allow to cool but allow a little heat to remain. Meanwhile, put the chopped dill in a small bowl or ramekin, and our over the wine vinegar. Mix through so that the vinegar starts to infuse the flavour of the dill. Then, add the honey, mustard, and olive oil, season to taste and mix well (I use a mini whisk). Set aside. Now, salad assembly begins. The amount of effort you want to put into this is totally up to you. Add the salad leaves to the bottom of a large salad bowl. Then, distribute evenly the julienned chicory, fennel, and sliced red onion. Next, slice the potatoes in half, and place evenly. Then, take the avocado slices, and carefully place between the potatoes. Then, sprinkle the blueberries on top as evenly as possible. Carefully, take the smoked mackerel slices (as they have been skinned, they'll be quite delicate) and lay in spoke formation so that they join in the centre. Then, add the lemon slices and dill in the centre to garnish. Finally, drizzle the dressing over the salad. Grind black pepper over the salad to taste. If not a fan of fish, why not try something else such as smoked duck breast, smoked chicken or smoked turkey? Mackerel and blueberries- it’s inspired! Awesome! It’s healthy too! Thank you for the recipe.